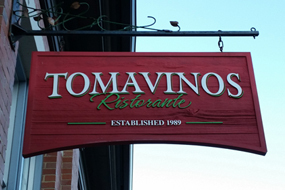 At Tomavinos, we are not only passionate about extraordinary food and exceptional service, we are philosophers, athletes, raconteurs, artist and lovers of nature. We strive for excellence in every aspect of our lives but especially in the quality of our product. We use only the finest of local organic ingredients and are constantly searching for and incorporating new and exciting ideas into our repertoire. We have been serving up our award-winning pizza for more than two decades and our goal has always been and will continue to be giving our customers an unforgettable culinary experience.